Not only does it last for the equivalent of 100 cigarettes (1000 inhalations) but our unique 'Habana' flavour tastes like a high quality 'Cubana' Cigar from Cuba. Long time user of over 3 years. Work really well and very effective. I just don't have need of the real ones anymore so I am quids in ! Very good attempt at reproducing authentic cigar. A bit pricey and delivery came 2 days late - otherwise 4 or 5 stars. I buy a box of these every 2-3 weeks. Presented in a nice compact presentation box of 5 pieces, it is much more economical than buying them individually. The smoke produced is rich and smooth - for me its a perfect substitute for the much more costly real thing. A good set of cigars provided in a neat little case. I like that they are small and very light and the best part is that if they are dropped they bounce and still work perfectly fine. 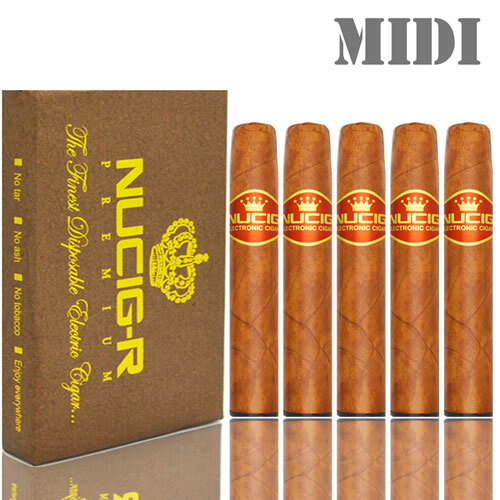 I have bought this cigar in packs of 5 several times and it works very well. No need for ash trays and I for one do not smell like one.